The Friends of Lyon Mountain Mining and Railroad Museum is housed in the former Delaware and Hudson Railroad Station on Standish Road in Lyon Mountain, NY (map/directions). During its season, the museum is open on Wednesdays and Saturdays from 10:00 AM to 2:00 PM. The museum's season begins on the first Saturday in June and continues until the Saturday before Columbus Day. Visits and tours may be arranged at other times by appointment. The Friends of Lyon Mountain also maintain a museum website. 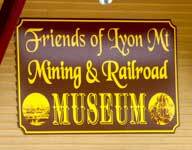 Facebook members: Join the groups, Lyon Mountain, NY and Friends of Lyon Mountain Mining and Railroad Museum on Facebook. The Friends of Lyon Mountain purchased the railroad station, which was constructed in 1903, in August 2000. They worked very hard to raise money and restore the building in order to make it suitable to house the museum. The Friends also succeeded in placing the building on the state and national historic registers, making the restoration project eligible for state and federal grants. The Friends of Lyon Mountain were formed by members of the Chateaugay Arts Council interested in creating a museum in Lyon Mountain. Many artifacts and photos had been collected for such events as Heritage Days, Mining Days, and Railroad Days, and the Friends wanted to find a permanent home in which to preserve and display these historic treasures. Through grants, donations, membership dues, and various fundraising efforts, funds were accumulated and used to renovate the entire building with particular attention being placed on historical accuracy and authenticity. Among other projects, the exterior was fully restored, the interior painted, and the floor refinished. The Friends have also been very busy collecting, cataloguing, and restoring artifacts; refurbishing furnishings; and organizing many displays. The artifacts are related, of course, to the iron ore mining and railroad industries, both of which played major roles in Lyon Mountain's history. Friends members volunteer their time to watch over the museum's contents and act as tour guides when the museum is open to visitors. When the museum is open, various displays of artifacts may be viewed, and books and calendars are available for sale. Many visitors found they could not see everything in one visit and came back for more! If you're interested in helping or joining the Friends of Lyon Mountain, read on to see what you can do. The Friends of Lyon Mountain offers two types of memberships. A single person may join the Friends for one year at a cost of $15. Alternatively, a single person may also obtain a lifetime membership at a cost of $500. For more information on memberships and donations, visit the Lyon Mountain Mining and Railroad Museum website. When the museum is open, members are admitted at no charge. In addition, the Friends send members a periodic newsletter to keep them up-to-date on the Friends' various activities and events. In order to raise money for the tremendous expenses of restoration and operation, The Friends of Lyon Mountain are involved in various fundraising activities throughout the year. The Friends are a not-for-profit organization and hold dinners, raffles, and other events from which proceeds go directly towards restoring, operating, and maintaining the museum. A few of the ongoing or upcoming fundraising events are listed below. For more information about events, fundraising, or donations, please write to the address listed on the Contact Info page or visit the Lyon Mountain Mining and Railroad Museum website. 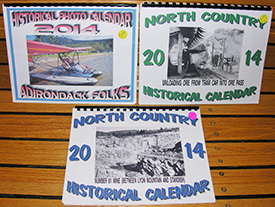 Calendars are sold by the Friends of Lyon Mountain each year. Every year there are multiple calendars, each containing a different set of photographs related to Lyon Mountain history. 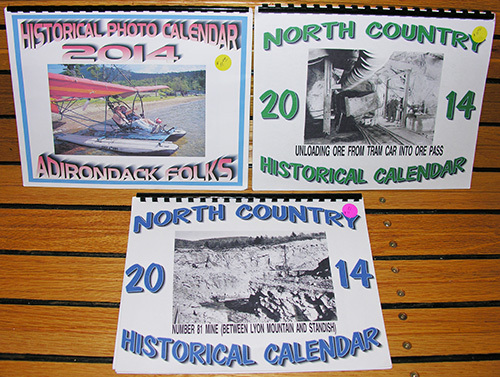 Leftover calendars from past years are sold for $5.00 each, and calendars for the current year are sold for $11.00 each. For each calendar, there is also a $2.00 shipping & handling fee.